Got some stuff on my mind, so I'm not posting much, but I am working on various projects. 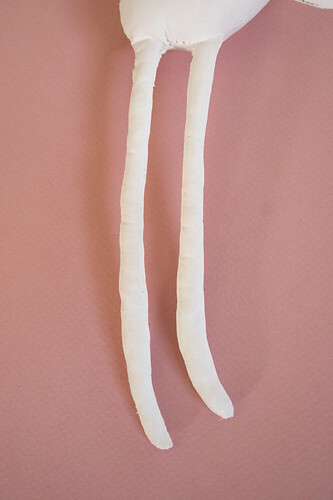 Including these here skinny legs, attached to another painted sewn toy (like the ghost I did a few weeks ago). I love how it looks, all gessoed up and ready for painting. It's quite stiff at this point, it almost feels like clay or some other hard sculpted medium. These legs are quite skinny. Like pencil skinny. It took me quite a long time to turn them inside out - and I had to use tweezers, working them out bit by bit. But it's worth it really, I love how they look. *"Raising Arizona" reference. I can't think of the word "unpainted" without putting "Arizona" after it. I am so damaged by popular culture. The other direction for a title could have been "Skinny Legs and All." My personal favorite reference from Raising Arizona is "a way-homer," but no one ever gets it. Interested to see what might be attached + painted on those skinny legs. You aren't damaged by it, you're enhanced by it! I still break out in the ridiculous "I love him so muuuuch!" routine when I want to be over the top about my affection for someone. Nice gams on that doll. It's a good thing you titled it the way you did. Who would read a post with a title like "Unpainted Huffenheim"? I also like to make little guys with very skinny legs, and those limbs are killer to turn out. I did find a tool that I like a lot, though. It's a loop turner, but it's not the straight stick kind. It's shaped like a pair of tongs, but the two ends meet together at a point. I found it at Hancocks, and I'd be happy to send you a photo of what I mean, if you'd like. It's made my toymaking immensely easier. FOrgive me but they look like udders to me! It is all in the mind of the beholder! But I saw it in Italian... so the phrases ... are not familiar to me! Skinny legs looks cute already. You inspired me to do gocco, and you like my favorite movie! I made some gocco shirts for my baby that say "I think I got the best one!"... Email me if you have a baby and I'll send you one!